Shake well.Â For Adults: take 1 tablespoon (15 mL) daily with a meal. For Children 4 years and older: take 1 teaspoon (5 mL) daily with a meal. REFRIGERATE AFTER OPENING TO PRESERVE FLAVOR. De-ionized Water, Vegetable Glycerin, Natural Flavors, Non-GMO Soy Lecithin, Citric Acid, Malic Acid, Xanthan Gum and Potassium Sorbate (as preservative). Not manufactured with wheat, gluten, milk, egg, fish or shellfish ingredients. Produced in a GMP facility that processes other ingredients containing these allergens. Caution:Â Consult physician if pregnant/nursing, taking medication, or have a medical condition. Keep out of reach of children. Contains Xylitol, do not feed to pets. **This product may contain insignificant amounts of naturally occurring iron present in colloidal minerals. AAC = Amino Acid Chelate SelenoPureâ„¢ is a trademark of Nutrition 21; Chromium ChelaviteÂ® is a registered trademark of Albion Labs. ; VitaBerryÂ® is a registered trademark of VDF FutureCeuticals, Inc.; FloraGLOÂ® is a registered trademark of Kemin Industries, Inc. Please Recycle. Family owned since 1968. Caution:Â Consult physician if pregnant/nursing, taking medication, or have a medical condition. Keep out of reach of children. Contains Xylitol, do not feed to pets. 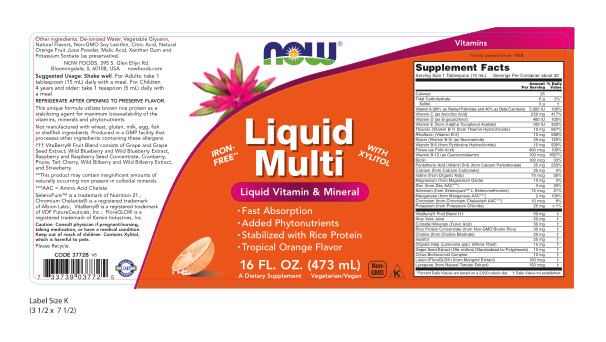 **This product may contain insignificant amounts of naturally occurring iron present in colloidal minerals. AAC = Amino Acid Chelate SelenoPureâ„¢ is a trademark of Nutrition 21; Chromium ChelaviteÂ® is a registered trademark of Albion Labs. ; VitaBerryÂ® is a registered trademark of VDF FutureCeuticals, Inc.; FloraGLOÂ® is a registered trademark of Kemin Industries, Inc. Please Recycle. Family owned since 1968.